Many, many thanks to all those who gave money and are giving money via the CATS website (link at the side). It was interesting that Arran, Carradale and Campbeltown saw the biggest number of people handing me notes and change - fantastic generosity. And great coverage of the ride and CATS in the national press (especially the Sunday Post and Daily Record) and several local newspapers (special thanks to David from the Arran Banner for his enthusiasm. I've decided I want to live on Arran). Thanks to Jenny and Ken, my BBC colleagues, and to Dave D for repairing my chain! If you're interested, the bike I used was a 2004 model (new old stock) Orbit Ventura. The frame is Reynolds 520c Chromoloy, fantastically supple and forgiving. Brooks B17 leather saddle (15 years old) is the only way to travel. Tyres were a bad mistake: Schwalbe Marathon Slicks are NOT up to even mildly rough stuff, despite having 'kevlar belts'. Plagued by a punctures in the back tyre following my spill on the Forth and Clyde towpath...turned out to be a tiny hole in the tyre casing that was pinching the tube. I'd use Slime tyre inserts and Slime-filled tubes if I was doing it again. And despite loving that Orbit frame, I'd probably go for a 26-inch wheel expedition bike like the Thorn Nomad. It has the Rohloff 14-speed hub gear, which I'd also want to use. My Shimano Deore Derailleurs were a menace, impossible to keep adjusted, and the maladjusted chain eventually snapping (possibly aided by the presence of a removable link, which is just stupid). I'd also get proper panniers, like Ortliebs. The cheap Countryman front panniers (off eBay) were awkward and disintegrated, though the cheap Raleigh rear panniers were surprisingly impressive. I would use SPDs, I think. But maybe not. They really help climbing but are useless for getting off and pushing! Axiom bar bag was fantastic, as was Altura Nevis jacket. Lycra is, I'm afraid, a necessity, though Endura baggy over shorts disguise the look. Vaseline and Sudocream saved my bacon. Oh, and don't be tempted by a trailer. I watched a poor chap with a top of the range Santa Cruz mountain bike, towing a Yak Bob, having the invisible trailer crushed by a car boarding the Lochranza ferry. Trailers and recumbents are invisible to drivers because no-one expects thenm to be there. I'LL BE FILING PIXTURES AND TEXT VIA MY NOKIA COMMUNICATOR, SO I MAY BE MORE TERSE THAN NORMAL! But for the moment...I'm verbose and nervous! 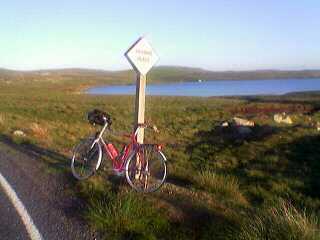 Last night I did the first leg of the trip, home (Hillswick) to Lerwick, 35 miles, for which I allowed four hours. I surprised myself by doing it in three. There were moments of thrilling speed (the Lang Kames, the bleak stretch of moorland in the middle of the Shetland Mainland, saw me averaging 19 mph)as well as the grinding uphill horrors of the Clavie (one mile from my front door) and the last horrible hill up from the golf course just outside Lerwick. Tonight, having packed my panniers, the only nagging pain from that first big ride is in my knees, which are 50 years old and protesting. Tomorrow, I'll drive into Lerwick, do the show from there, then get the boat south. On Thursday morning, all being well, I'll cycle to Stoneheaven leave the bike there, and catch a train back to aberdeen for the show. Then I'm getting a lift back to Stonehaven, and I cycle to Montrose. Overnight in Montrose and then...onwards to Campbeltown. Remember this is all in aid of CATS (not cats). And you can contribute HERE. Well, the ride begins officially next Wednesday, the 19th, and tonight I managed 12 miles in calm conditions round the Ronas Voe/Gluss Water circuit. I've abandoned the toeclips and returned to clipless SPD pedals, and what a difference. How I ever thought I could manage without them I don't know. The biggest worry is the weather, and that will only be a major issue in Shetland, where a headwind on Wednesday morning would be a disaster. I have to cover 36 miles into Lerwick and then do a radio show before catching the ferry south, and so far 12 miles is the most I've cycled. 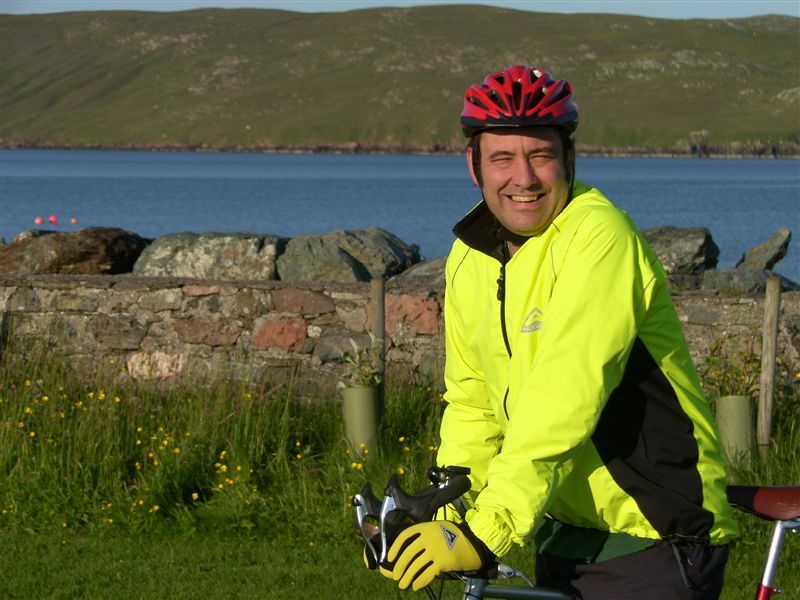 I am nervous about this first leg of the journey, and so at the moment I'm planning to take the van into Lerwick on Monday, leave it there and catch the bus home, then cycle into Lerwick either on Tuesday morning, if the weather's good, or Tuesday night. Then I could drive the van home with the bike, and drive into Lerwick on Wednesday. Or just wait until Wednesday. That way I get the chance of three possible weather windows. One way or another, it's on. The hardest bits are the first, err... four days - Hillswick to Lerwick (36 miles) Aberdeen to Montrose (anything between 40 and 55 miles depending on the route), Montrose to Strathmiglo (60-odd) and a whopping 70 to Glasgow, though that's a Saturday and I've got the whole day and evening if necessary. Whose idea was this anyway? There's so much on youtube to wallow in...but all I can say is that I saw this lot at the Apollo in, oh, was it 1976? And was knocked sideways. As for Wilko Johnson's haircut and suit...remind you of anyone, Alex? Yes, it's really happening! Check out Tom's Big Bike Ride for more. No, it's not Lycra. It's not even Gore-tex. It's just yellow. ...or back to the afternoons, to be precise, after a fortnight of the 10.30 - 12.30 slot. Has to be said the late nights take a bit of getting used to. I mean, even if you're going to bed normally at 1.00 am, the amount of adrenalin left after two hours on air does not make for immediate and easy slumber. Still, I really enjoyed broadcasting at that time of night - there's a whole different, much calmer atmosphere to it, a sense of intimacy. Whatever. Having said that, the afternoon show is like being back among old friends, and I'm touched and grateful by all the 'welcome back' messages. I'll be off for even longer - four weeks - in August, touring the nightclubs and fleshpots of England and Scotland with Joe West from Texas and my son James while John Beattie and James MacPherson take on the show. Anyway, to more pressing matters: peat. Our friend Lornie has cut three peat banks for us this year, and we're very, very late in tackling the crucial drying processes (raising, turning, stacking, bagging). It was a beautiful night, so I headed off on the bike for a couple of hours' backbreaking toil. Traditionally women's work, I can see why men didn;t fancy it. I'm aching, and I didn't even get one peat bank raised. It's quite important, as we're thinking of moving much more to a solid fuel heating regime this winter. Oil has become catastrophically expensive, and looks like getting worse. So we're pondering some kind of basic windpower heating system, topped up with solid fuel (peat) or maybe retaining the oil for emergencies. At any rate, the sheer brutal tedium and physical work in peat production is essential to the plan. So it's off to the hill every night, if the weather's reasonable. Shouldn;pt have any trouble sleeping after that!